An update on my adventures! It has been a while, sorry about that. I’ve been busy with looking after my health: getting physio, ankle braces, going to support groups, getting yet another diagnosis – PoTS – and a second lot of medication. Steampunk and creativity had to take a back seat for a while but then, true to my Aspie style, I’ve spent three days throwing pacing to the wind and decoupaging to my heart’s content. 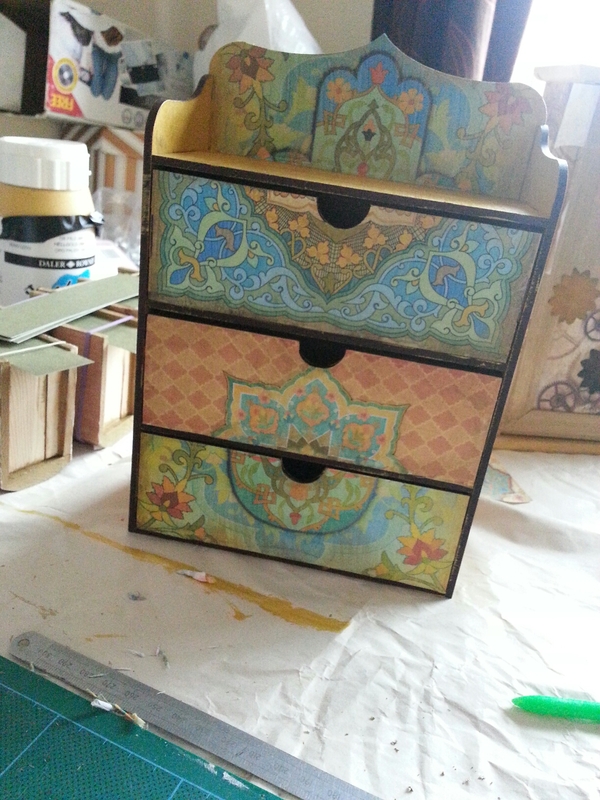 The picture above is my own jewellery box and I’ve made more in various styles. I’ve set up a second online shop (www.ConsciousCrafties.com/Crafties/Zebras-Bazaar) and am about to rent shelf space in a local craft shop too! With so much going on, and a rained-out village fayre yesterday that took my last decent-sized Spoons, I’ve been in retreat today, recovering. I must make resting a priority next week. The Facebook group I set up for Steampunks with chronic illness/disability, ‘Steampunkable’, has been attracting more members. It is great to share a common interest with those who also live with challenges. I’m keen to get my Autism assessment date but first have to go for an echo cardiogram and dental surgery (for unwisely positioned wisdom teeth). So, I thought about apologising for my irregular posting but you know what? This is how my life is. It ebbs and flows, so I shall allow my creativity to surface when it is good and ready and only ask for your patience and acknowledgement, dear reader. A well-written and reflective piece that I’m glad to share with you. These past few weeks, I have presented some principles I find indispensable for the steampunk genre: Be Mindful, Be Courteous, and Be Creative. This week, I offer you the last, perhaps the most important one. If there were a battle cry for steampunks, the words “Be Splendid!” would ring out the globe over. You see, “splendid” is more than a word to express interest when someone asks if you’d care for tea and a biscuit. It is a call to rigorous and deliberate excellence in all that you do. This characteristic has the potential to hold all the others inside of it, but there is a very important aspect to this principle that I wish to talk about. Splendidness is an active, on-going process, and, above all, a mindset. Whenever anyone asks me to pick favourites – be it films, books, music etc., I always struggle to line up my likes in linear fashion and see who ends up at the front. With me, it’s more of Sphere of Wonder containing circles made up of concentric lines and divided blurrily into categories. So when the Ambassador once more invited me to be a part of this wonderful celebratory event and unveiled the theme, so many things rushed forth for my attention that it has taken me months to think about what to include. ♡ Steampunk can be a family activity. One person sprang to mind immediately however – my brother Matt. I wouldn’t be writing this without him, nor would I have explored the Steampunk realm so thoroughly. He and I set up Etsy shops at almost the same time. We’ve always been the kind of siblings who are best friends. We live near each other and often bounce ideas off each other. He’ll find me bits from the charity shop to upcycle and I’ll give him jewellery findings or sewing tips. We often share a stall at Steampunk events and have a great laugh together. Matt isn’t the only family involved, however. My husband and our daughter have been swept up in the steam, creating their own characters who are unrelated to mine yet part of the same crew – the crew of the Gargantuan Class Airship “The Unpronounceable”. Stories are a large part of my products too. Each piece of jewellery and every accessory conjures ideas and images as I make them. One line of tribal steampunk products got rather over-excited and an entire fictitious culture was created, giving rise to The Aether Nomads Project. I do hope that tattybustles catch on! Abi of Wiserabbit is a wonderfully talented lady whom I have had the pleasure of knowing for years, having met at LRP, and count among my most treasured friends. How wonderful that through twenty years of Live Roleplaying to have met such wonderful people, a few of whom also dally in the delight of Victorian inspired science fiction fantasies. Matt and I were fortunate to enjoy the company of the lovely Genevieve last year at Asylum. I marvel at the last few years and – permit me a little name dropping -am so proud of these images, with costume and props by people who have costumed and ..er..propped(?) Professor Elemental and taken by the photographer who is one of the Steamgirls. I’m a little starstruck. Mainly though, I am honoured to work collaboratively with such talented and really lovely people. Here are a few examples, the three albums that I’ve thrown a few pennies at (as have hundreds of others) in order to help these wonderful artists manifest their dreams right into our eager, waiting ear’oles. 😉 Somehow or other, I have a tangible connection with all three which is so very meaningful to me. Not wishing to come across as egotistical but don’t we all love it when our lives directly influence something that gives us pleasure and a sense of achievement? With Steampunk, it is all very up close and personal in the nicest possible way. ♡ The costuming – goggling at other folks amazing attire! ♡ The contraptions – especially those made with imagination and ingenuity, of whatever skill level. 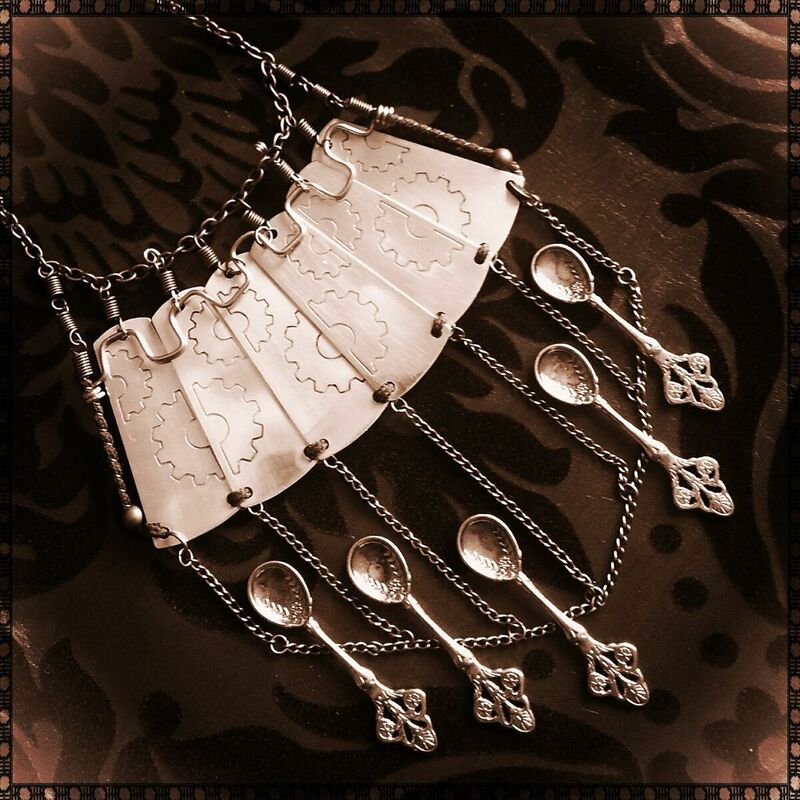 Necklace by TheNavigatrix with etched elements by ArcaneArmoury (plus added Spoons! Speaking of diversity, Steampunk offers a warm welcome to those of all nationalities, ages and abilities and is a wonderfully accessible hobby/lifestyle. 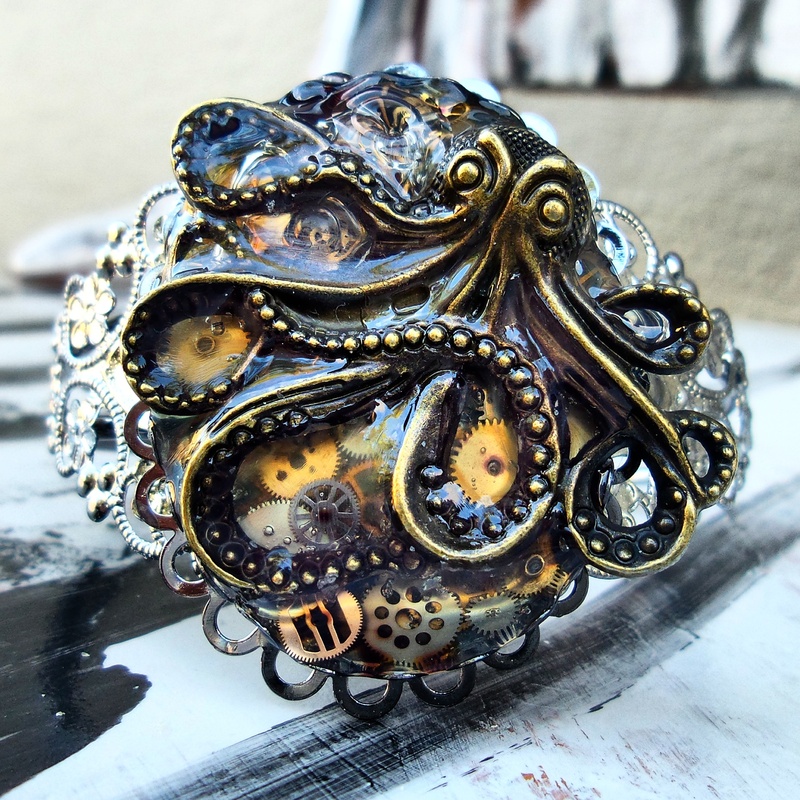 ♡ Steampunkable – this is really quite new. Inspired by the clever modifications to wheelchairs, mobility scooters, braces and other aids that I’ve seen both at events and online, I decided to start a group for those of us dealing with disabilities and/or chronic illness and doing it Splendidly! If you’d like to join the group, put your request in here. It is the people who are drawn to this creative playground, this cognitive casserole, this celebration of Splendidness who make it what it is. Yes, we’re all human and sometimes we don’t play together as nicely as we could but the value we put on community and good manners means that we keep this engine oiled and running smoothly most of the time. It is simply a pleasure to be in your good company. For the third year running, The Navigatrix will be contributing to the celebrations. Would you care to join me? Steampunk Hands Around the World returns for it’s third year, continuing the celebration of the best that the global steampunk community has to offer. The 2016 theme of the annual month long blogathon is “My Favorite Things”. Each day from Monday, February 1st through Monday the 29th, contributors will share some of their favorite steampunk people, events, and things from every corner of the planet. Everyone, steampunks and non-steampunks alike, will be able to share in the information about who and what inspires us to keep exploring, expanding, and enhancing our community every day. ‘Her Majesty Loses an Officer’ by Martin Livingston ~ Part Two of Three. The second in the special short story written for #ApeQuest. Has Geoffery been spotted yet? I keep telling my husband that he could write a book… do please leave a comment if you enjoyed it. Part Two coming soon. Needless to say, the Nomads are keeping an eye out for him too and collecting reports in an attempt to intercept him at the correct prophetically-calculated point in space-time. The more images we receive, the better the chance of restoring him to Elemental Manor, where and when he belongs! So follows a very fantastical Steampunk tale, with a fleeting report of the adventurous ape hidden somewhere in its telling. Settle down with a cuppa and enjoy. Ironically, it has taken me longer than I’d hoped to get this written up, due to a lack of Spoons. 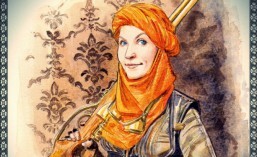 If you follow my blog, you probably know what a Steampunk is. What you may not be aware of, however, is what on earth a Spoonie is. The concept was created by Christine Miserandino and you can read about The Spoon Theory here. In brief, it is an analogy to help averagely energetic folk understand what it is like to live with the fatigue that comes with some chronic illnesses and disabilities. I’m a SteamSpoonie myself, having been diagnosed with FND in 2013. I’m still on the diagnostic journey at the moment which is why my shop and blog aren’t as regularly updated as I’d like. I feel that it is important to raise awareness to a certain degree. It nurtures compassion and understanding. It is also important to ‘always look on the bright side of life’, which is where we have a wonderful advantage being Steampunks! I sent out a call for interviewees and several brave folk answered, so I have decided to run the Steampunk Spoonies interviews in several parts. 1. Introductions first! Could you tell us a little about yourself and whereabouts in the world you are from? Charli – I was born in Middlesex but now live in Lincoln after going to university here. I work in the gas and electric utilities sector as a technician, and also as a self-employed photographer, artist and crafter. Chiisai – I am a 21 year old, 4’7”, wheelchair using steampunk enthusiast and cosplayer. I’m from Cambridge, UK, though currently am based in Ipswich. Kermit – I was born in Myrtle Beach, SC on September 2nd, 1983. With both parents having grown up on tobacco farms, I was given your typical country upbringing in a beach town. Somehow I escaped without an accent, though. In September of 2013 I moved to the San Francisco Bay area, and live there currently. I am ridiculously introverted, and filled with child-like wonderment. I have a passion for most arts and sciences, valuing them both equally. Animals and their rights are incredibly important to me, but currently cannot afford a pet of my own. In addition to jewelry, I occasionally make wall hangings and refurbish furniture in creative ways. 2.Why do you identify as a Spoonie? Charli – In 2013 I was diagnosed with severe Clinical Depression, having struggled with it alone for the previous four years. At the time, people were fearing not just for my mental health, but my physical health too. The depression at that point was really quite bad, I would stay in bed most of the day because I didn’t have the energy or will to get up, and I contemplated suicide frequently. I didn’t want to eat, my sleep pattern was really messed up, and I couldn’t go out, because I was too scared of the outside world. There was always a kind of shadow hanging over me, the so called “Black Dog”, and it would always bring me down, even when things were going well. My sense of self-worth was pretty much non-existent and I hated everything about myself. Depression is a lonely thing, even when you have people around you, and I still struggle with feelings of loneliness. Even now, when I have it mostly under control, I have to be very careful. If I feel as though my emotions are becoming too low, I’m getting even the littlest bit stressed or I’m getting too tired to control my thoughts, I have to take myself out of the situation and find someone to talk through it all with me, just to keep me from cracking again. Chiisai – I identify as a Spoonie as I have Ehlers-Danlos Syndrome, Functional Neurological Disorder, Asperger’s, associated mental health issues, and hearing loss. Kermit – I was diagnosed with PTSD about ten years ago. With PTSD, you can have better and worse days, but it’s not something that ever goes away. My spoons are planned and taken in a similar fashion, but for different reasons. 3. How did you get into Steampunk? Charli – I was invited by someone I considered as one of my few friends, but I repeatedly turned her down. My depression makes me really bad at meeting new people, even now, and I didn’t want the trouble of making a complete fool out of myself. Eventually though, I found myself wandering around the area that the local Steampunk Society meet. It was a “Steampunk night”, and I was alone in the cold. I figured I would go into the pub and find my friend, as I needed to talk with her about a photography project anyway. I sat alone at a table, watching the Steampunks for a while, but my friend didn’t show up until much much later, and I was introduced then. About a month later I went back, because I felt a connection to the aesthetic more than anything, and I’ve been a Steampunk ever since! Chiisai – I have always been interested in fixing/modifying mechanical and optical devices, but it’s only been in the past 3 years that I’ve become involved in the social aspect. 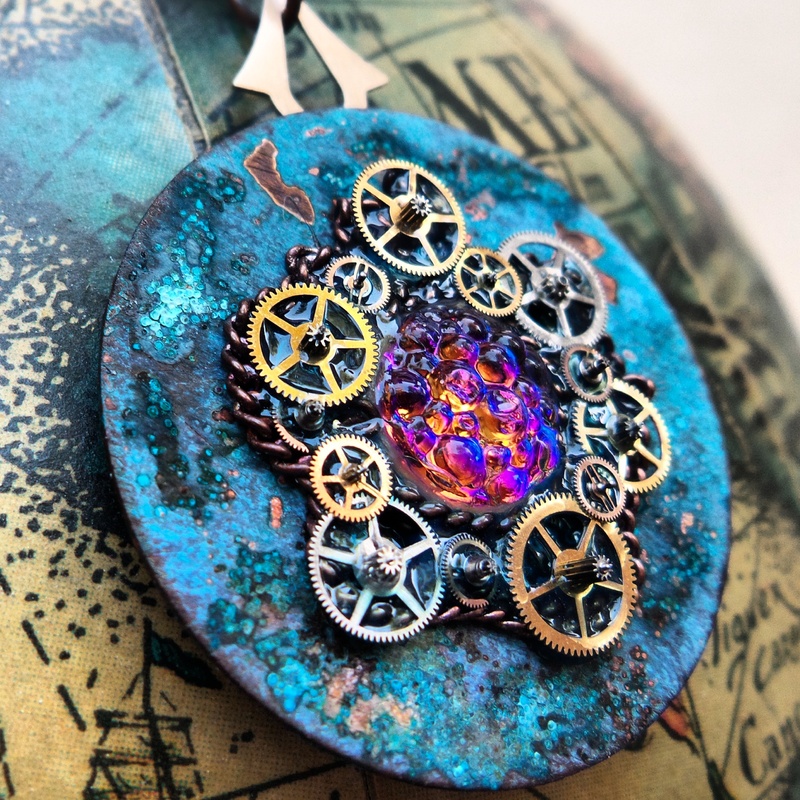 Kermit – I’ve always enjoyed the various aspects of Steampunk, but didn’t realize I could call it that until I had an idea for clock hand necklaces. When I looked them up to buy, I noticed they were associated with what I only knew as people in top hats and goggles. Come to find out, all my previously preferred aesthetics, eras, and genres take place within this newly found genre. I haven’t put it down since. 4. What limitations does your chronic illness/disability have on your every day life? How does it affect your involvement with Steampunk? Charli – Depression makes me really bad at meeting new people, and I often find that I wish myself blending into the background. I feel anxious in crowds and often find myself feeling that I will never compare to the people around me. Sometimes I wake up, and I’m sad for no reason, and it doesn’t go away for weeks, sometimes months. I lose my appetite and I don’t want to face people. I also judge myself as a Steampunk incredibly harshly, and if I feel I have “let the movement down” in any way I can become withdrawn. That means that I will avoid certain events or places, and if people I know aren’t going, I won’t even think about heading that way. Chiisai – The combination of EDS and FND mean that I use a wheelchair outside my house, while the Asperger’s and hearing loss affect my communication skills. These mean it’s harder for me to travel independently to get to events, which are often far away, and also to interact with people once there.EDS affects my hands a lot, so it takes much longer to make things, though this means I have a greater sense of achievement when a project is finally complete. Kermit – With me, it’s hard to convince myself to use spoons for what needs to be done, because my spoons can easily be taken all at once. Any trigger causing a flashback, embarrassing social interaction, or simply things not going as planned can take more than one or all of my spoons. My reserve spoon hopefully gets me to a safe place before I blackout, or enter a dissociative state. Because of my shortcomings, I have not been able to participate as much in the Steampunk world as I’d like. I can’t be around people for long periods, so events are out of the question. I can’t seem to earn enough money for them or a costume anyway, as the only jobs I know how to do require too much social interaction. Making my jewelry helps calm my mind, but I can rarley afford supplies. Even when I have something made, I can easily convince myself it’s not good enough to be shared with the community. 5. 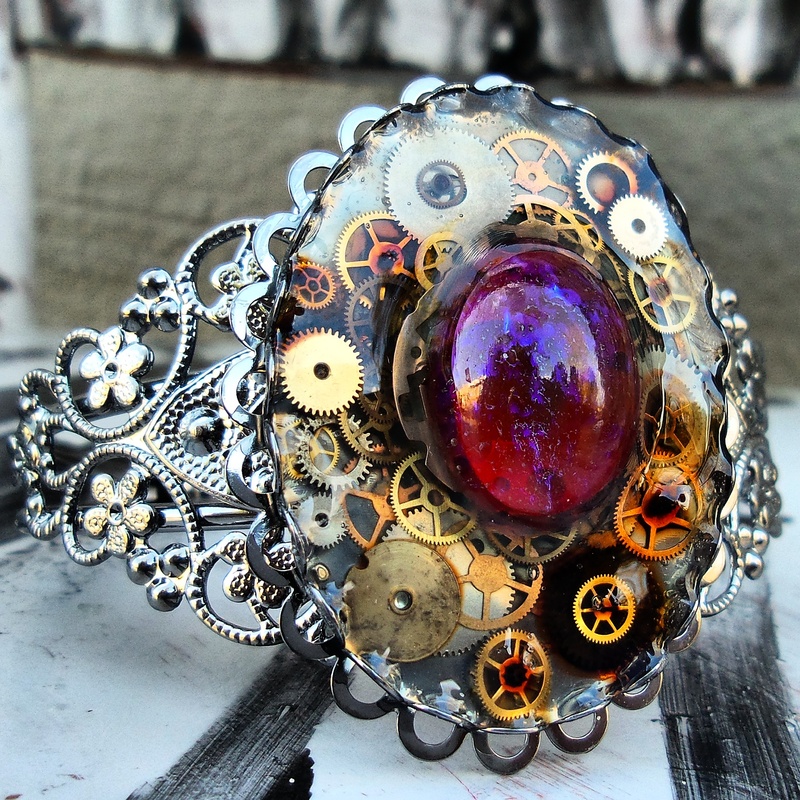 How does Steampunk enrich your life? 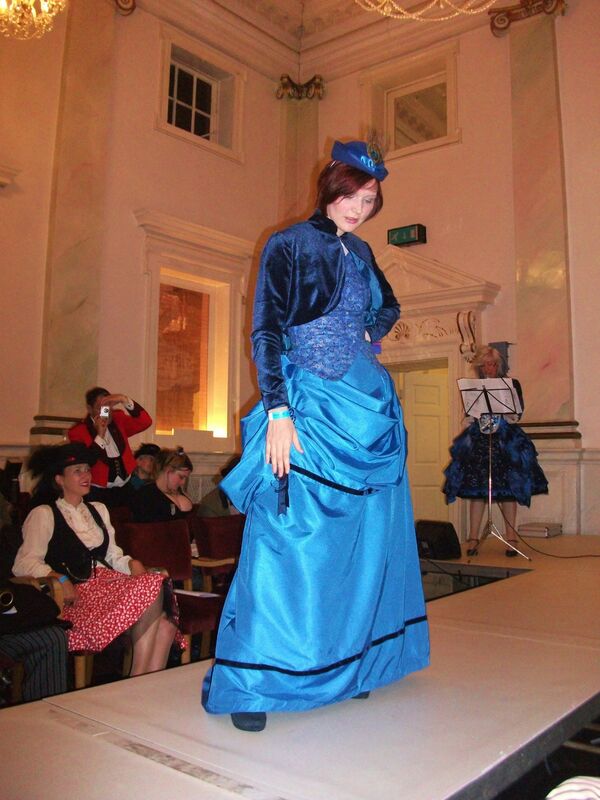 Charli – Steampunk gives me a creative outlet and has allowed me to meet people who are like myself behind the depression. It has given me a sense of belonging; a place where I feel as though I can really be myself. Now that I know there are others out there who share some of my oddities, I don’t feel so isolated, and I have made a number of new friends. I wouldn’t be anywhere without them. Chiisai – Steampunk gives me something positive to focus on when I feel depressed, and has expanded my social circle a lot. Kermit – I think my mental illness lends a different take on the spoon analogy. I can actually gain a spoon sometimes. Occasionally a positive occurrence can have enough impact to add a spoon. 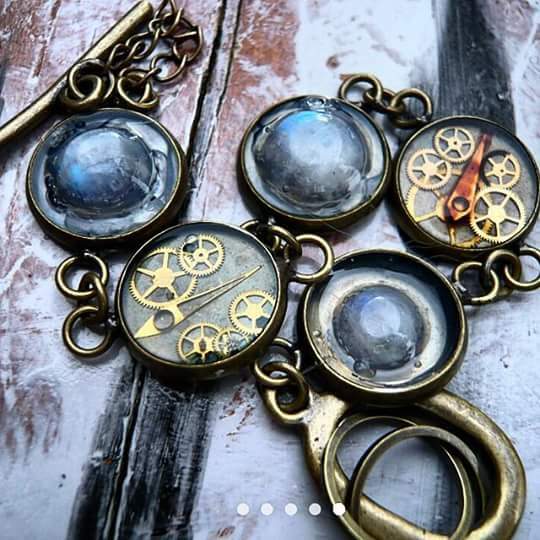 I was always the science and math kid, and never thought I had any real artistic talent before I started making Steampunk jewelry. Making art I’m proud of can add a spoon. Getting enough likes and positive comments on a post about that piece can add another. I’ve mostly experienced kind and supportive Steampunks who make me feel good about what I do. These people also share lovely things with me, and true inspiration can also add a spoon. 6. Does being involved in Steampunk have a positive effect on your sense of self? Charli – I understand more about myself now that my lifestyle has a name! And I don’t feel as though I have to make excuses for being who I am anymore. I simply say, “I’m Charli, I’m a Steampunk”. And if people don’t like it, I’m happier about telling them where to go! I am definitely more comfortable with who I am. Chiisai – Definitely. When at meetups I feel able to be completely myself, and not so constrained by trying to be ‘normal’, which leads to increased self-esteem and confidence. Kermit – Most certainly. It’s really the only place where I am rarely disappointed with myself or others, which makes me feel appreciated and inspired. It also makes me feel like less of a nerd for always wanting to be proper and polite. It gives me a chance to express a side of myself that I’m confident in, but others don’t always understand or take the right way. Doing so reinforces my confidence in general. 7. Do you have any current projects or plans that you’d like to share with us? Chiisai – I’m currently modifying a pair of Nerf revolvers [these are great fun], designing corsets, and my boyfriend is making me a pair of folding wings – if only these let me fly! Kermit – Haha. I’m just trying to feed myself, currently. I’ve recently started chemically oxidizing metals to produce patinas in my jewelry, but quickly used up the little supplies I could afford. I also want to get into electroplating, soldering, and possibly welding. 8. Silver linings – what is the best thing about being a Steampunk Spoonie? Charli – I am loathe to say that there are any silver linings to depression, unless you count the fact that it can be controlled and diminished, but being a Steampunk gives you a wonderful support network. There are people within Steampunk who have already been there and suffered, so they’re always there to lend a hand. The whole community is so vibrant, dynamic and diverse, that there’s always someone there to support you, even when you feel at your lowest. 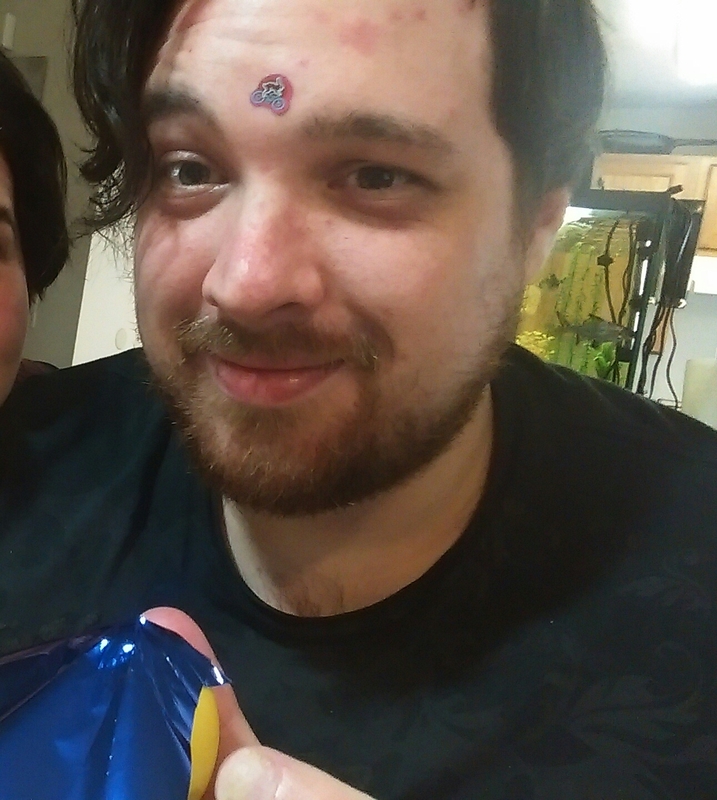 And I met my fiance, who has also suffered with depression, through Steampunk, so perhaps that’s my silver lining! Kermit – It makes me odd. I find oddities fascinating. 9. Are there any charities or support groups you’d like to mention to help raise awareness? Chiisai – FND Hope is a wonderful charity, and much needs to be done to raise the profile of this often misunderstood and actually very common condition. EDS UK are a very good source of information and support and their information helped me finally get my diagnosis after 21 years of being a medical mystery. Thankyou all for responding and sharing quite personal perspectives. Part 2 will follow…at some point. All of this is just window dressing. The musings of a girl with EDS and Gastroparesis as she learns to live with a nasojejunal feeding tube. Because life doesn't have to be a confusing anxious mess.